We arrived in Rome on Sunday evening. The place we are staying – Eva’s Rooms, recommended by Barbara – is about two minutes walk from the foot of the Spanish Steps. The bed is a bit hard, but there is plenty of space and the location is great. The breakfast is a minimal – coffee/tea/chocolate and glazed croissants – but it is served in the room which is very convenient. Monday dawned with a bright blue sky, and remained clear and hot all day – quite a change from the weather in Ireland. 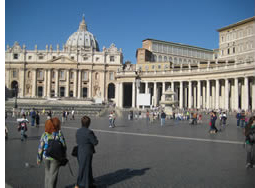 We had planned to spend the morning at the Vatican Museums, but after we saw the length of the queue, which looked like it would involve several hours standing in line, we changed our plans and went to St Peter’s Basilica first. There was something of a queue there as well, but nowhere near as long, and it was in the decorative piazza, rather than running along the outside walls of the Vatican, with nothing to look at but traffic. The interior of St Peter’s was awe-inspiringly vast, and full of breathtaking artwork, but all felt a bit impersonal. Though maybe this was partly the effect of a million tourists (including us) taking photos. 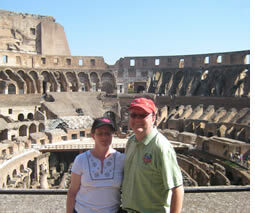 For the afternoon, we switched from Christian to Imperial Rome, and went over to the Colosseum. It was certainly bigger than the amphitheatres I saw a few years ago in Nimes and Arles! From the Colosseum we went to the Palatine. We joined on to a tour group with a quite engaging guide, but partway through the tour he was approached by a member of the police (apparently, though we didn’t see him show any identification) and was told he had to stop as he wasn’t authorised for the area. Fortunately the Rome guidebook that Brendan had loaned me had a detailed map and enough information that we weren’t completely at a loss. 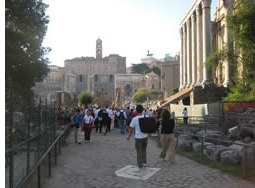 From the Palatine we walked down through the Forum, again making extensive use of the guidebook. I generally prefer taking photos of ruins with as few people as possible in them (don’t always succeed) but in this instance I actually felt that having crowds in the photos worked, as it gave a sense of bustle and activity, and being the centre of Roman life. On the way back to the hotel we walked past the Trevi Fountain. It was certainly impressive (as were the sheer number of tourists looking at it), but I thnk I actually prefer some of the smaller fountains. The plan for Tuesday had been to see the Capitoline Museums, then the Pantheon, and then cross over the Tiber and wander around the Trastevere area. But a minor wrong turn meant we found ourselves passing by the Pantheon, so of course it made sense to change the order of things. This was actually very good, as it was a lot less crowded in the Pantheon at 9:00 than it would have been later in the day. 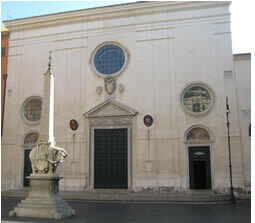 Since we were in the area, we then went to the Santa Maria Sopra Minerva (nothing much on the outside – except for the unusual Bernini elephant statue – but spectacular Gothic interior) and the GesÃ¹ (first Jesuit church in Rome). After this we went to the two Capitoline Museums, and there were so many things to photograph that the camera battery ran out! So when we left, we went back to the hotel to pick up the other camera, and then decided to have a lateish lunch at Babbington’s Tea Rooms (in the Piazza del Spagna) – it was quite nice, but horrifically expensive. We decided it was too much of a hike to go from there to the Trastevere area, so instead we went to Castel Sant’Angelo, where we also got to enjoy the views from the top terrace.